Last week I told you about the crazy birds that moved onto our front lawn. After last weeks bad weather (a tornado actually touched down just a couple of miles away) I was happy to find they were still there. 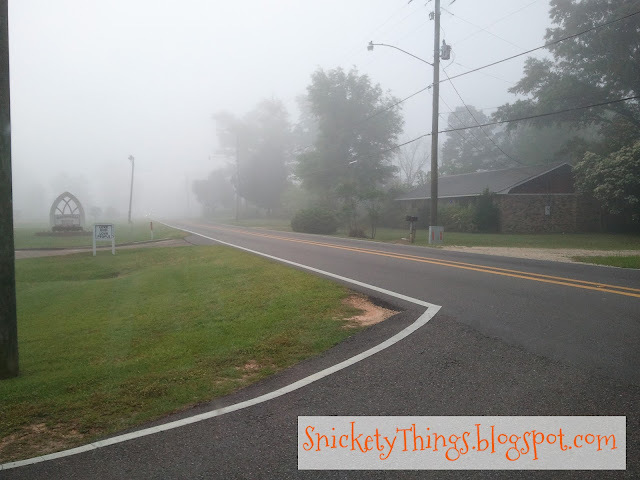 It has been foggy here in the mornings and bad weather is supposed to roll in again this weekend. I decided to check on the birds before they roll in. See the little flags we put out for them? They have helped quite a few times in preventing them from being stepped on or driven over. 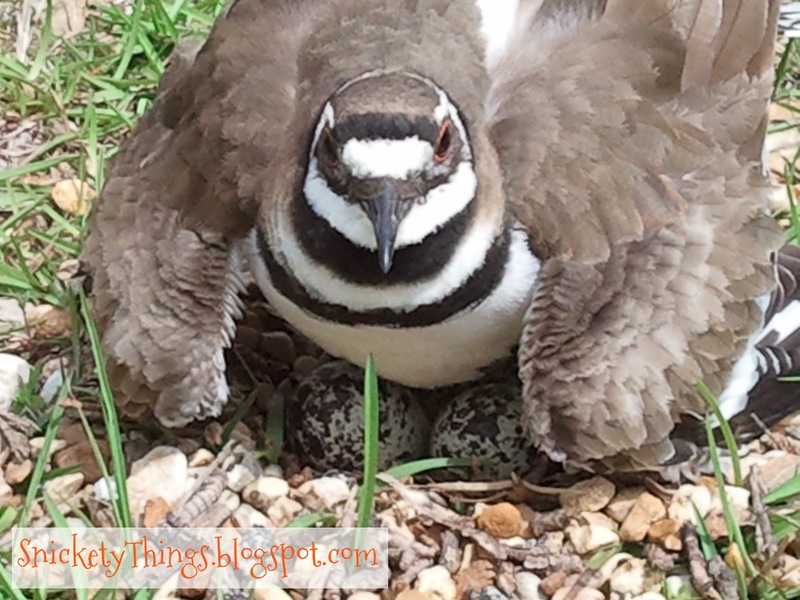 Here she is protecting her nest when I checked on her. She is getting used to me now. 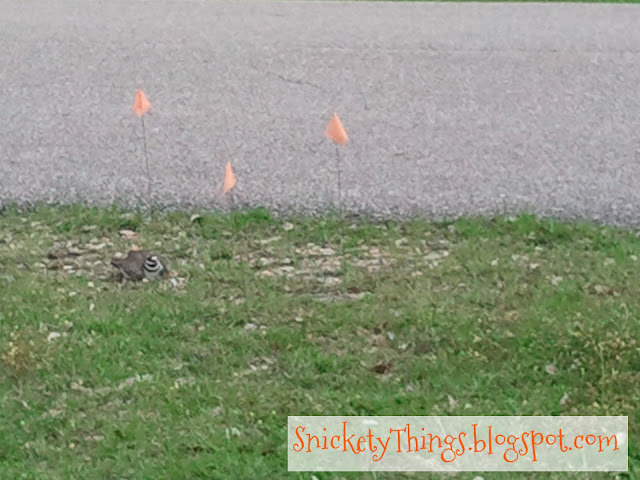 She as chirping at me to let me know not to step on the nest (I did some research on the birds and how they act). Here is a shot of the eggs being safely guarded. I think this has to be my favorite shot of her so far. I took it with my phone. Can you see she is still giving me warning. Here you can see she is still being protective, but she was no longer scolding me for coming near. In fact, the other bird came over and sat near without pretending to be hurt (their other distraction method to draw you away from the nest). They are supposed to hatch around Easter. My girls can't wait. 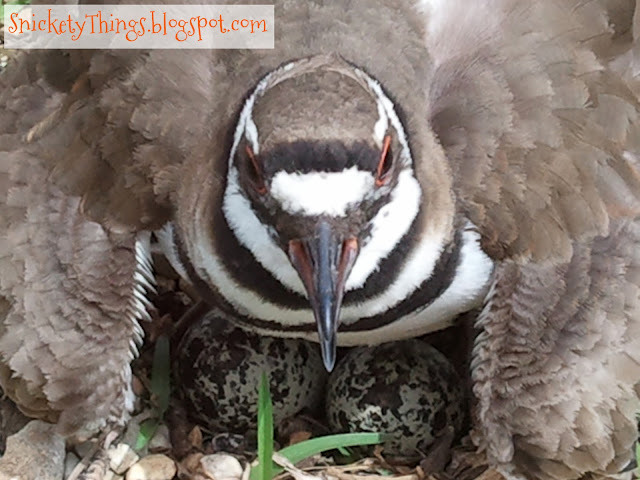 Those Killdeer are crazy! By accident I stumbled onto a group of the cutest babies you'd ever want to see. 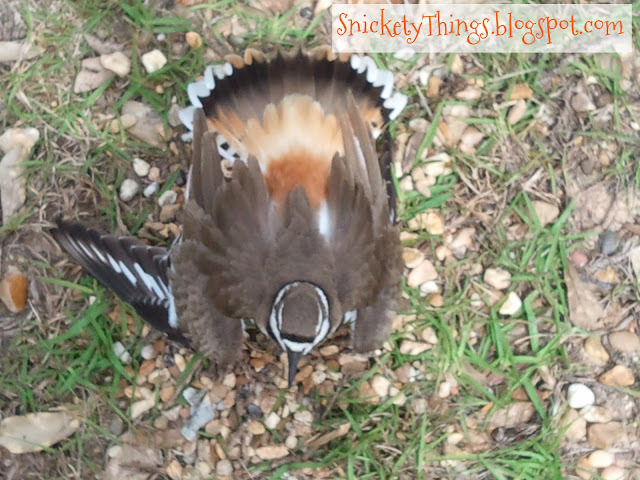 The father kept walking away dragging his wing until he couldn't take it anymore and flew directly at my head. I got away without an injury and learned a healthy respect for this bird! I agree, they are crazy! The male bird does seem a little more stubborn.